In 2008 Slovenia generated 19,800 tonnes of sewage sludge from urban and combined waste water treatment plants, of which most was deposited in landfills of non-of hazardous waste, while the rest was incinerated, composted or exported. Since 15 July 2009 untreated sludge from urban waste water treatment plants may no longer be deposited in landfills. Sludge from wastewater treatment plants is defined as waste material that is a by-product of wastewater purification in wastewater treatment plants or remains after emptying domestic wastewater cesspools. The treatment of this kind of waste is governed by the Decree on waste management (Official Gazette of the Republic of Slovenia, No. 34/2008), and the input of this waste in soil and agricultural surfaces is governed by the Decree on the limit input concentration values of dangerous substances and fertilisers in soil (Official Gazette of the Republic of Slovenia, No. 84/05) and the Decree on the management of sewage sludge from the urban waste water treatment plants (Official Gazette of the Republic of Slovenia, No. 62/08). Special requirements regarding the emission of substances in wastewater discharged from urban wastewater treatment plants are defined in the Decree on the emission of substances in wastewater discharged from urban wastewater treatment plants. Biologically recover of sludge at appropriate plants, especially at regional waste management centres, and particularly those types of sludge that are less contaminated with heavy metals or not at all. To ensure sufficient facilities for thermal treatment of waste, where up to 70,000 tonnes of sludge from wastewater plants drained to 30% of dry matter can be recovered. Sludge is generated in wastewater treatment plants. In the past years, more than half of it was disposed of at non-hazardous waste landfills; however, since 15 July 2009 untreated sludge from urban waste water treatment plants may no longer be deposited in landfills. The sludge contains 40-50% of organic substances and its decomposition contributes to the release of greenhouse gasses. Professional opinions regarding recovery and further use of sludge from waste water treatment plants are split. Sludge from wastewater treatment plants is rich in organic substances, and hence, some experts advocate its deposition on agricultural land. However, the sludge produced in combined wastewater treatment plants in urban and industrial areas can contain hazardous substances. Owing to their volume and characteristics, these substances can have a negative effect on agricultural areas or the quality of groundwater. Therefore, sludge must undergo biological, thermal or chemical treatment or long-term storage, or any other appropriate treatment before it is used on agricultural areas in order to reduce its fermentability and the health hazards resulting from its use. Pedological maps and laboratory research by the Agricultural Institute of Slovenia show that, so far, the soil in Slovenia is in general rich in organic substances (on 86.2% of agricultural land above 2%, and on 30.9% of land above 4%). Such relatively favourable situation derives from the fact that grassland prevails in the structure of agricultural land and that rather large quantities of manure are used on arable land and permanent crops. The Operational Programme of environmental and transport infrastructure development 2007–2013 states that, for the time being, all our wastewater treatment plants neither have any special facility for sludge disposal, nor do they, at their present quality level, meet the requirements for depositing into land; as considering the fact that large portions of land in Slovenia are declared as either water protection zones or Natura 2000 area, or special protection area (SPA), management of sludge from waste water treatment plants is a crucial issue. The Operational Programme of discharge and treatment of urban wastewater and rainwater provides that se sewage sludge shall be incinerated, if sewage sludge cannot be safely deposited into land. Priority for the incineration of sewage sludge is given to urban areas with no other possibilities of sludge recovery. Construction of one or two facilities for waste-to-energy treatment or incineration of the remaining waste and sewage sludge has been envisaged. According to the Environmental Agency of the Republic of Slovenia, Slovenia generated 19,800 tonnes of sewage sludge (dry substance) from urban and combined waste water treatment plants in 2008. About 8 thousand tonnes were deposited on landfills for non-hazardous waste, about 7 thousand tonnes were incinerated, slightly over 2 thousand tonnes were composted, and about 3 thousand tonnes were exported for artificially prepared soils and other recovery procedures. Use in agriculture has not been recorded since 2006. 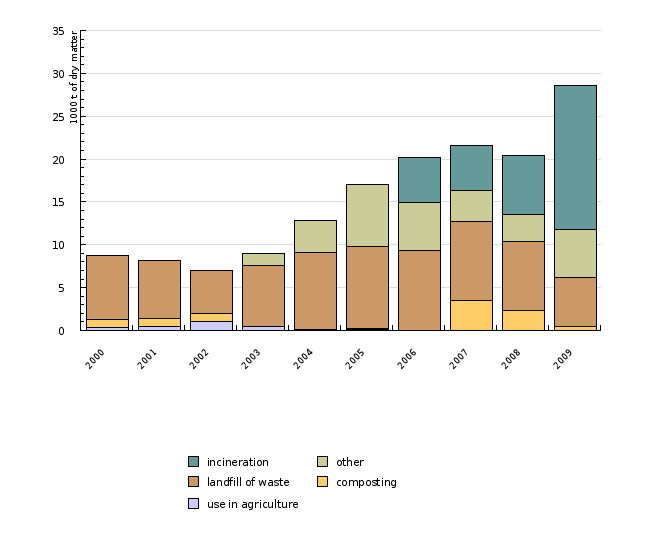 European countries deposited less and less sewage sludge on landfills, and have also reduced its input in agricultural land; increasing, however, is incineration and co-incineration in industrial facilities. Objectives summarized by: Operational Programme on waste deposition aiming at the reduction of deposited quantities of biodegradable waste for the period up to the end of 2008; Novelation of March 2008 states none of these or other concrete objectives. Methodology and frequency of data collection for the indicator: Data on the quantity of superfluous sewage sludge from urban or combined waste water treatment plants are taken from reports on operational monitoring of urban or combined waste water treatment plants. The obligation to carry out the monitoring and submit reports is defined in Article 27 of the Decree on the emission of substances and heat in the discharge of wastewater into waters and public sewage system (Official Gazette of the Republic of Slovenia, No. 47/05). The form of monitoring is defined in the Rules on initial measurements and operational monitoring of waste water and on conditions for their implementation (Official Gazette of the Republic of Slovenia, Nos. 35/96, 29/00, 106/01). Data are collected in both written and electronic form and than processed in the urban and combined wastewater treatment plant database at the Environmental Agency of the Republic of Slovenia. Data may change also for previous years, in case that the liable entities are at some later date requested to review the submitted data or if they themselves establish some discrepancy in the data from previous years. Data processing methodology: Figure OD8-1 shows the annual quantity of sludge from wastewater treatment plants and ways of sludge treatment (in 000 tonnes) in Slovenia.